This is EM Cases Episode 103 Preventing Burnout and Promoting Wellness in Emergency Medicine. 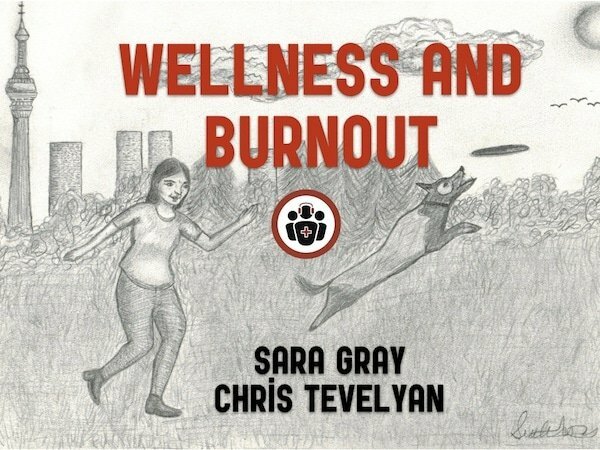 Cite this podcast as: Helman, A, Gray, S, Trevelyan, C. Preventing Burnout and Promoting Wellness in Emergency Medicine. Emergency Medicine Cases. 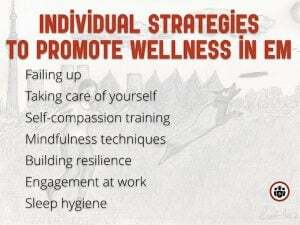 November, 2017. https://emergencymedicinecases.com/preventing-burnout-promoting-wellness-emergency-medicine/. Accessed [date]. Why does preventing burnout and promoting wellness matter in emergency medicine? Compared to the general population, physicians have higher burnout and suicide rates, and Emergency Medicine has the highest rates of burnout of all the medical specialties. Burnout can predispose to coronary artery disease, hypertension, mental health issues, substance use, social conflict, alienation, isolation, and a sense of futility in one’s career. Burnout is also associated with increased medical error, professionalism issues and diminished ability to empathize – all leading to worse quality of care. Traditionally, we have kept silent in the face of these stressors, wearing our fatigue as a badge of honour. That paradigm has thankfully started to shift. By promoting wellness in ourselves and our medical systems, we will have more satisfying careers, live healthier lives, take better care of our patients and possibly even improve patient outcomes. How can we recognize burnout in ourselves and our colleagues? Burnout is occupationally focused and occurs when demands people face on the job outstrip the resources they have to meet them. There are several individual contributors to burnout, including responsibility burden, time pressures, difficult work interactions with patients, their families and consultants, financial concerns, medical errors, medical-legal law suits and strained work-life balance. Self-perceived medical errors are one of the most important contributors to burnout. Fifty percent of physicians report that medical errors lead to increased anxiety for future errors, decreased job confidence, decreased job satisfaction as well as potential mental health issues. Why are we so hard on ourselves when we screw up? We were all taught from a young age to believe in the all-knowing infallible doctor, we feel very uncomfortable admitting to error, and this is a natural path for high achievers like us who strive for perfection, (despite the fact that perfection is a myth). Some of us may perceive error to indicate weakness in ourselves. This often results in staying silent after errors, which leads to embarrassment, shame, guilt and isolation. We are all going to fail. Learning to accept this eventuality and incorporating it into our daily life, will allow us to grow as individuals, to more effectively teach others and to take better care of our patients. We should strive for post traumatic growth and thriving after failure instead of feelings of shame and isolation. Find a Failure Friend. An empathetic work friend who understands the context; someone who is your safety net and in return you can be their safety net. Be a good Failure Friend to a colleague. Listen/hear them out and empathize/provide affirmation rather than giving advice or solutions. Use reflective listening like you would with a patient and then come up with a joint plan. Teach from your mistakes. Give talks around your difficult cases that incorporate personal strategies on how to cope after the fact, rather than only concentrating on the medical aspects of the case. See how its done at Harvard with their Schwartz Rounds. Be willing to seek help. Seek help from your hospital or univeristy wellness center, get a therapist or life coach even if you don’t have a psychiatric diagnosis. Our mental health is important. It is important to break through the stigma. Schedule hack: Deliberately schedule in time for yourself in your calendar and protect it like you would any other high priority activities. Find what brings you inner peace and schedule it into your week. This can be going for a walk in nature, listening to music, yoga, exercising, etc. Learn more from the EM:RAP episode on this topic. Learn to say “No”: Scott Weingart has some strategies to help with this on his EMCrit podcast here. If you do say no to an opportunity, try to nominate someone else better suited for the same job! Disconnect: Employ strategies to minimize distractions and schedule a specific time each day for social media activities/emails. Cal Newport discusses more on this in his book “Deep Work”. You can only be as compassionate with others as you are with yourself. If you are highly judgemental and critical of yourself, you are likely more judgmental and critical of your patients, their families, colleagues etc. Physicians aren’t great at this. And becoming better takes time and training. Start by paying attention to your inner voice. Practice having it say things to you in a kinder way. Speak to yourself after a fail the way you would speak to your best friend. Reframe simple mistakes by being kind to yourself instead of judgmental or critical. Remind yourself of common humanity – you’re not alone. Try not to over-identify with mistakes; just stay mindful. Dr. Kristin Neff has more strategies to help in the process at http://selfcompassion.org. Mindfulness means practicing awareness of the present moment and letting go of ruminations about the past and fears regarding the future. This skill can be called upon at any time during the day improving maladaptive behaviours and increasing self-awareness. Deep breathing or “box breathing” can help relieve stress during difficult patient encounters, during a difficult resuscitation or just before the arrival of a cardiac arrest patient in your ED. Building resilience is a good way to prevent burnout and face obstacles in a more psychologically healthy way. 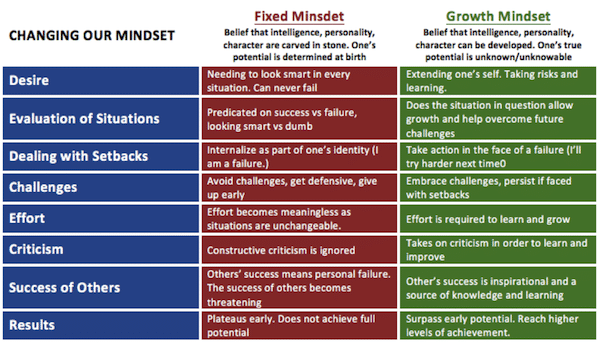 Below is a framework by Stanford University psychologist Carol Dweck on how we can shape our mindsets in the face of adversity. Get involved: Find something you are passionate about at work and spend about 20% of your work time on it. It can be protective against burnout if you spend this much time doing something you love as part of your day to day job. Collaborate: Work with people in your department to improve your work environment. This will also help build camaraderie and support networks. Sleep deprivation impairs short term recall, performance on intensive tasks, increases distractibility, error of omission and commission, and risk tolerance – all things important to EM. Shift work causes sleep debt, associated with mental and physical health issues. Sleep Hygiene – employ a pre-sleep routine, no caffeine or alcohol before sleep and after night shifts retire in a room that is quiet (consider ear plugs or white noise machine), dark (consider eye mask) and free from interruptions. Napping – mid-afternoon either 10mins or 90 mins (not 30mins) allowing 1hr to ‘wake-up’, and try to nap during the anchor period of your night shift (off-duty sleep supplemented with naps while on duty is effective for sustaining vigilance, learning, and memory when working at night). Light therapy – sleeping in pitch dark and waking in bright light help to signal our circadian rhythms. No screens for 1-2 hours before sleep – the blue light from smartphones, tablets and laptops signals your brain to stay awake. The burden of responsibility that emergency medicine providers hold has been steadily increasing in recent years and there are no signs of this trend tapering off. This growing burden of responsibility has occurred in the setting of increasing resource challenges and increased expectations for high quality patient care. Emergency physicians may be evaluated by metrics set by stakeholders that aren’t always clinically relevant. Often at work we are shackled to computers and pre-printed order sets, minimizing our interaction with people and flexibility in decision making. Well intended quality metrics may actually be contributing to burnout as they may not equate with quality patient care. The culture that expects an omniscient, all knowing physician is still present in some centers. Yet, the huge body of knowledge in emergency medicine has been growing rapidly and it has become increasingly difficult for the individual emergency medicine provider to keep up. We have yet to develop fully from a performance culture to a learning culture. Even though duty hours per physician have decreased over the decades overall, time spent at work is perceived as less supported at present. We look for support outside of work because their is a diminished perception of support at work. Physical space has diminished as well. In many centers there has been a loss of staff common space and lounging areas for emergency providers to come together and share in a sense of comradery and support, which may lead to an increased sense of isolation on the job. Find different mentors for different purposes geared toward supporting wellness. 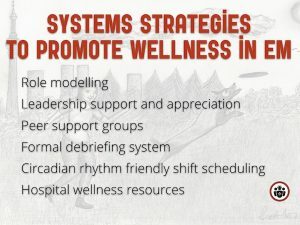 Create a supportive culture that prioritizes health care workers’ wellbeing. Simply having an organization that recognizes the health care workers’ well being is invaluable toward improving engagement and reducing burnout. Examples include increased physician autonomy, increased involvement in decision making and reward systems that acknowledge the value they bring to the ED. It costs nothing to express gratitude, but it costs mountains when value is eroded. ED and hospital leaders should advocate for effective and efficient electronic medical records and ordering systems so that physicians are not shackled to computers for the majority of their shifts, and are given tools to provide high quality care while also allowing them to practice the art of medicine. Medicine is a team sport. Play it like it is! Ice cream rounds: A forum for discussion about burnout, wellness and coping strategies – while eating delicious frozen treats! Encourage participation from someone in a position of leadership and have them share personal stories surrounding a particular theme. Other ways to promote peer support include retreats and sabbaticals. A formal debriefing system after critical events can help give an opportunity for everyone to talk about what happened and why. Casino shifts preserve the anchor period: from 2AM to 6AM is the most important time to get sleep for your circadian rhythm to be sustained. Consider adding casino shifts at your institution to help preserve this period. Benefits of casino shifts: more total sleep, reduced sleep debt, shorter recovery time, reduced cognitive impairment, improved work performance and career longevity. Scheduling forward: rotate shifts from day to afternoon/evening to night as opposed to the other way around to preserve circadian rhythms. Talk to your hospital and advocate for resources such as post night shift sleep rooms for physicians and nurses, child care options for hospital staff, exercise facilities and healthy food options outside banker’s hours. Ishak WW, Lederer S, Mandili C, et al. Burnout during residency training: a literature review. J Grad Med Educ. 2009;1(2):236-42. Germer CK (2009). The mindful path to self-compassion: feeling yourself from destructive thoughts and emotions. New York: Guilford Pressx. Ripp JA, Privitera MR, West CP, et al. Well-Being in Graduate Medical Education: A Call for Action. Acad Med. 2017;92(7):914-917. Wallace JE. Mental health and stigma in the medical profession. Health (London). 2012;16(1):3-18. Montero-marin J, Zubiaga F, Cereceda M, Piva demarzo MM, Trenc P, Garcia-campayo J. Burnout Subtypes and Absence of Self-Compassion in Primary Healthcare Professionals: A Cross-Sectional Study. PLoS ONE. 2016;11(6):e0157499. West CP, Huschka MM, Novotny PJ, et al. Association of perceived medical errors with resident distress and empathy: a prospective longitudinal study. JAMA. 2006;296(9):1071-8. Hjeltnes A, Binder PE, Moltu C, Dundas I. Facing the fear of failure: An explorative qualitative study of client experiences in a mindfulness-based stress reduction program for university students with academic evaluation anxiety. Int J Qual Stud Health Well-being. 2015;10:27990. Tzortziou brown V, Patel I, Thomas N, et al. New ways of working; delivering better care for people with long-term conditions. London J Prim Care (Abingdon). 2017;9(5):60-68. Crowe L. Identifying the risk of compassion fatigue, improving compassion satisfaction and building resilience in emergency medicine. Emerg Med Australas. 2016;28(1):106-8. Mcdonald J, Potyk D, Fischer D, et al. Napping on the Night Shift: A Study of Sleep, Performance, and Learning in Physicians-in-Training. J Grad Med Educ. 2013;5(4):634-8. McKee A, Wiens K. Prevent burnout by making compassion a habit. Harvard Business Review. 2017;5(11). Valcour, M. Beating burnout. Harvard Business Review. 2016;11. Drs. Helman, Gray and Chris Trevelyan have no conflicts of interest to declare. This is a very powerful and inspirational write up. Points duely noted.